The One and Only Babe. Back when I was a kid, a photograph of George Herman "Babe" Ruth appeared on a full page of the Sunday colored section of the New York Daily News. 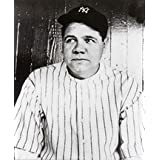 According to the text that accompanied it, the photo had originally been published on Babe Ruth Day in 1947 and was now being printed again because of the many requests by the readership. The page was carefully clipped from the paper and placed in a frame that hung in my room throughout my boyhood. I still have it. As I sit here at my computer terminal pounding away at the keys, all I have to do is turn my head about 66° to the left to revisit my youth when baseball, especially Yankees baseball, meant as much to me as the air I breathed. Somewhere along the line, I also placed within the frame a postcard won at an amusement park arcade picturing Ruth's Hall of Fame plaque. Unanchored, it slides around whenever I take the frame from the wall. Though he had died when I was still an infant, The Babe was my hero. I read every book about him in the library and poured over the Red Book like it held the secrets of the ages. I knew all his records and his stats. There are many wonderful biographies posted on the internet. What follows is the text that accompanies the photo hanging on my wall. Some of details are no longer true, but that does nothing to diminish the Babe of my memory. 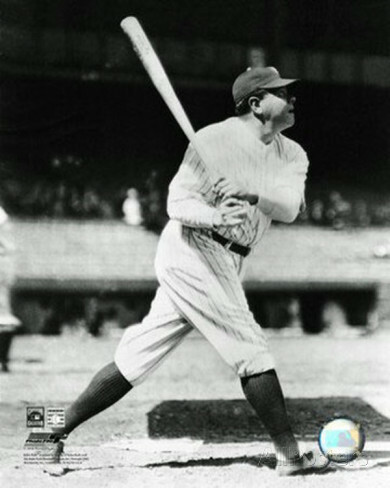 MLB baseball player Babe Ruth's forte was hitting homers. He led the American League in round-trippers 10 times, and tied for the lead twice. The largest lifetime total in baseball history is his 714. Babe's most spectacular homer was the called shot he blasted in the '32 series with Chicago. Greatest of all his achievements is the season record that still stands: 1927 60 home runs. Babe's lifetime BA was .341. In 1924 he was the AL batting champ with a .378 average. 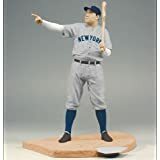 He scored in one season (1921) the most runs, 177; hit the most total bases, 457; attained the highest slugging percentage, .847. In 10 World Series he had a .325 BA and hit 15 homers. His highest single season average was: 1923 .393. 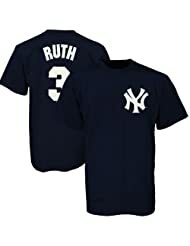 Although Babe Ruth and the New York Yankees are usually considered inseparable, Ruth broke into the majors as a pitcher for the Red Sox in 1914. In 1919, he was sold to the Yankees, after having been switched to the outfield because of his hitting. Following the 1934 season, he left the Yanks and closed out his career with Boston. To see the Babe's career stats, click here. 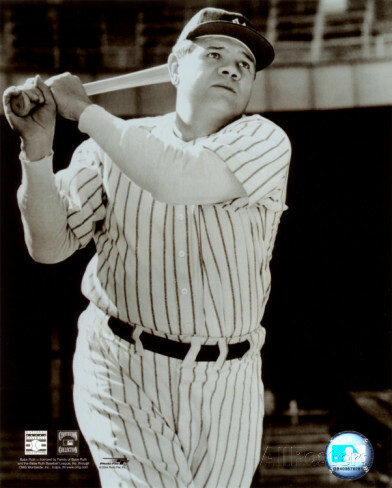 Featured on this page are the following Babe Ruth posters, prints and photos: Babe Ruth the Sultan of Swat, Babe & Lou Gehrig, Babe Ruth Bows Out, Babe with Three Bats, Babe Ruth - In Dugout, Standing Babe Ruth Poster, Babe Ruth 60th Home Run, Babe Ruth - Homeplate Action, Babe Ruth - Bat over shoulder, Babe Ruth - Milestones & Memories, Ruth & Gehrig, Babe Ruth - Classic Portrait, Babe Ruth - Tipping Cap, Babe Ruth - Frankie Buckley, Babe Ruth & Yogi Berra. 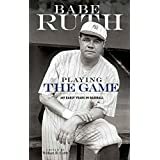 Among the books on Babe Ruth offered here are The Big Bam by Leigh Montville, Babe Ruth by Jim Reisler, Babe: The Legend Comes To Life by Robert Creamer, and Babe Ruth's Own Baseball Book by George Herman Ruth. 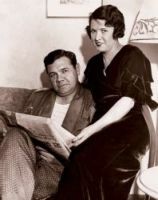 I found the photo of Babe Ruth and his wife Claire on The Chicago Tribune website. For 18 great photos of the Babe in Chicago click here.